China's President Xi Jinping speaks during the opening ceremony of the 2015 World Internet Conference. A closer look at China’s cyber strategy, and what it means for the world. China has been the center of attention on cyber issues and one of the very few countries yet to publish a report on its cyberspace strategy. People outside China who are eager to understand its cyber strategy are only disappointed by the lack of viable channels to find information they want. Such an information deficit has given rise to misunderstandings and misperceptions about what China would do and where it is heading in the cyber world. Things, however, are changing. China has recently started to articulate its cyberspace strategy, evidenced by President Xi Jinping’s statements at the 2015 World Internet Conference, China’s much-touted cyber summit at a tourist resort close to Shanghai and Hangzhou, the headquarters of the cyber giant Alibaba, and the National Meeting on Cyber Security and Information Technology in April 2016. On those two occasions, Xi outlined China’s nascent cyberspace strategy, and addressed some of the concerns of the outside world. Such an emerging strategy, however, needs to be scrutinized in light of China’s unique political discourse, if one wants to pick up the cues and grasp the trends beneath it. 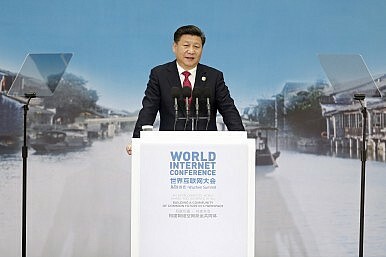 At the World Internet Conference in Wuzhen, Xi focused on the international dimensions of China’s cyber strategy, which include four principles on reforming the existing international internet governance system: respect for cyber sovereignty, peace and security, openness and cooperation, and good order. “A community of common destiny,” Xi’s new vision on the diplomatic front, is now part and parcel of China’s cyber strategy. Under the four principles, five action proposals were made concerning the digital gap, cultural diversity in cyberspace, digital economy, cyber security, and Internet governance. This “4+5” formula shed light on the core elements of China’s international cyberspace strategy. On April 19, 2016, the president turned to the domestic aspect of this strategy, which has six underpinnings: embracing the Internet, the Internet as a channel for the expression of public opinions, breakthroughs in core Internet technologies, security and development, as well as engagement of the private sector and IT professionals. There are always outside worries that China’s claims for cyber sovereignty may split the Internet asunder. These concerns, however, are unwarranted. China is not a leader in cyberspace. Nor does it have any intention to reinvent the wheel and replace the existing architecture of Internet governance. China only wants to participate in international Internet governance on an equal footing together with all other countries in the world. Such a position is not limited to the Internet, but finds its origin in many of China’s policies and practices in the real world. For instance, China has been all along committed to a non-alliance policy and undertakes not to interfere in other countries’ sovereignty. Many other countries also find China’s position acceptable, as massive cyber surveillance and penetration has undermined their security and social stability. They therefore stand behind the legality of cyber sovereignty. As a major player in cyberspace, China has put the Internet on its priority list of development. It is therefore very careful in formulating a cyber strategy. Hence, many avoidable tensions and conflicts with other countries occurred, particularly in cyber security. The Snowden revelations have added to China’s distrust in American Internet companies. There has been a growing call in the country for indigenous IT products. Authorities have also stepped up regulation of foreign businesses. Historically, China has grounded its policies in domestic realities and failed to foresee and assess their international ramifications. As China’s interactions with the United States have grown in the past few years, it has paid more attention to the impact of its domestic policies on the world. A case in point is the emerging cyberspace strategy. Overall, the strategy is balanced, open, and pragmatic. It would prevent many unnecessary conflicts in the cyber world and facilitate cooperation and competition between China and the United States. In China, contrary to some foreign media reports, it is widely believed that there will be no harsh rules against foreign enterprises, based on the No. 317 circular issued by the China Banking Regulatory Commission and the draft of China’s anti-terrorism law, the final version of which actually scrapped most of the cyber security-related provisions. This will, undoubtedly, reduce the uncertainties for foreign companies operating in China. This strategy also provides an opportunity for China and the United States to build up trust and undo the damage on their relations caused by the indictment of five Chinese military officers for economic cyber espionage and the threat of economic sanctions. Both sides should refrain from seeing each other as adversaries or major threats in cyberspace. Apart from their working group on cyber crimes, the two countries could well explore possibilities for a comprehensive cooperation mechanism to regulate behaviors in cyberspace and share malicious information. Private sectors in both countries should be aware of the importance of stable bilateral cyber relations for Chinese and U.S. interests. Such relations should by no means be hijacked by a handful of interest groups. Only in this way can China and the United States ensure healthy interactions in cyberspace. Lu Chuanying is a research fellow at the Shanghai Institutes for International Studies. His studies focused on cybersecurity and cyberspace governance.